All machines have been disassembled and parts such as belts replaced. All machines are cleaned inside and out, re-lubricated and thoroughly tested before they are sold. Used trade-in units but in excellent shape. Entire package including AC adapter, USB download cable, rechargeable battery pack, desktop cradle and software with license. Everything you need. Includes a 6 month warranty on parts and labor and free UPS shipping to business addresses anywhere in lower 48 continental states. Shipping to residential address an additional $5.00. $279.99 delivered 6 months warranty Original boxes with new license. Used trade-in units but in excellent shape with new rechargeable battery pack. They come in 2 different configurations. The first option is for the DS-5000 alone. No cables, software, etc. Refurbed machine with new battery pack. The second option is for an entire package including AC adapter, USB download cable, rechargeable battery pack, desktop cradle and software with license. Everything you need. Includes a 90 day warranty on parts and labor and free UPS shipping to business addresses anywhere in lower 48 continental states. Shipping to residential address an additional $5.00. 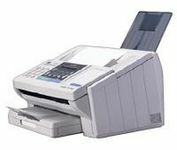 Used trade-in units that are refurbished to factory specs. These professional digital recorders are in excellent shape. They come in 2 different configurations. The first option is for the DS-4000 alone. No cables, software, etc. Refurbed machine with new battery pack. Both options include a 90 day warranty on parts and labor and free UPS shipping to business addresses anywhere in lower 48 continental states. Shipping to residential address an additional $5.00. Used trade-in unit but in excellent shape. Includes a 60 day warranty on parts and labor and free UPS shipping to business addresses anywhere in lower 48 continental states. Shipping to residential address an additional $5.00. Refurbished Two-speed (1.2 or 2.4 cm per sec.) unit with Speed Control, Auto-backspace, end of tape alarm, tape counter and erase Features. 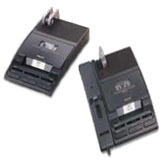 Includes: Foot Control & Headset OR Microphone, Power Supply. Includes a 60 day warranty on parts and labor and free UPS shipping to business addresses anywhere in lower 48 continental states. Shipping to residential address an additional $5.00. Refurbished Two-speed (1.2 or 2.4 cm per sec.) unit with Speed Control, Auto-backspace, end of tape alarm, tape counter and erase Features. Includes: Foot Control & Headset, Power Supply. Includes a 60 day warranty on parts and labor and free UPS shipping to business addresses anywhere in lower 48 continental states. Shipping to residential address an additional $5.00. These units are in excellent shape and a great buy at this price. Refurbished Two-speed (1.2 or 2.4 cm per sec.) unit with Speed Control, Auto-backspace, end of tape alarm, tape counter and erase Features. Includes: Microphone, Power Supply. Includes a 60 day warranty on parts and labor and free UPS shipping to business addresses anywhere in lower 48 continental states. Shipping to residential address an additional $5.00. These units are in excellent shape and a great buy at this price. Refurbished Two-speed (2.4 or 4.8 cm per sec.) with Auto Stop, Speed Control, Scan and Erase Features. Units in excellent working condition. 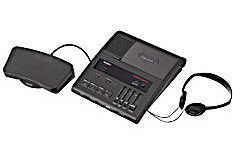 Includes: Foot Control & Headset OR HU-80 Microphone, Power Supply. Includes a 60 day warranty on parts and labor and free UPS shipping to business addresses anywhere in lower 48 continental states. Shipping to residential address an additional $5.00. $219.00 ea. Refurbished Two-speed (2.4 or 4.8 cm per sec.) with Auto Stop, Speed Control, and Erase Features. Units in excellent working condition. 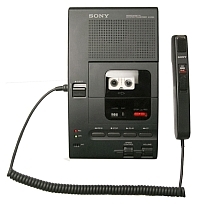 Includes: Foot Control & Headset OR HU-80 Microphone, Power Supply. Includes a 60 day warranty on parts and labor and free UPS shipping to business addresses anywhere in lower 48 continental states. Shipping to residential address an additional $5.00. Includes: Foot Control & Headset, Power Supply. Includes a 60 day warranty on parts and labor and free UPS shipping to business addresses anywhere in lower 48 continental states. Shipping to residential address an additional $10.00. Philips 720-T & 725-D Special! Prices Slashed! 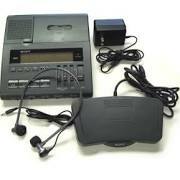 Used Philips Executive Desktop 720’s & 725’s mini-cassette transcriber and dictation units. Units are in excellent condition. Includes a 60 day warranty on parts and labor and free UPS shipping to business addresses anywhere in lower 48 continental states. Shipping to residential address an additional $5.00. 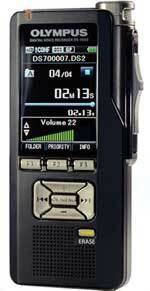 720-T Includes headset, foot control & power supply. *Transcription configuration cost is higher because we have to purchase new foot pedals to complete the transcriber package. Used foot pedals are in very short supply. Only one available, excellent condition. Traded in from a government agency. Professional grade machine with a low copy count. Completely cleaned, refurbished and tested. Comes with a UG-3350 toner cartridge. Includes a 60 day warranty on parts and labor and free UPS shipping to business addresses anywhere in lower 48 continental states. Shipping to residential address an additional $10.00.